DF992 CADETNVY. DEARFOAMS SLIPPERS / HOUSE SHOES. MACHINE WASHABLE. NEW, NEVER USED ! Black with gray and black animal print. Skid resistant sole. Machine washable. Foam cushioned foot bed. COLOR PEWTER. SIZE M (7-8). CONDITION NEW. 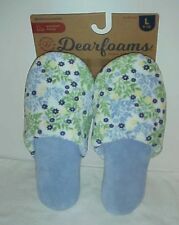 New Dearfoams Fuzzy Slippers Size Large 9 10 Navy blue, memory foam, machine washable, indoor outdoor, rubber sole, free shipping. I have other items available and I am happy to answer questions about any item. Thank you for looking! The quilted pattern has a light pink ribbon around the opening giving it an extra feminine touch. Fluffy terry material. Outsoles great for indoor/outdoor wear. You're already purchasing the item. Give us a shot and we will make sure that you will look to us again! Highlighted Features . NWT WOMAN'S DEARFOAMS MEMORY FOAM SLIP ON SLIPPERS FRESH PINK SZ LARGE 9-10 Shipped with USPS Priority Mail. We do not ship to Alaska/Hawaii, APO/FPO or US Protectorates. Soft, stretchy satin uppers. Size small (5-6). Give us a shot and we will make sure that you will look to us again! Quality Products. SLIDE ON OPEN TOE SLIPPER. SIZE XL, 11-12. BLUE WITH COLORED STRIPES. MACHINE WASH, INDOOR/OUTDOOR SOLES. NEW, NEVER WORN. 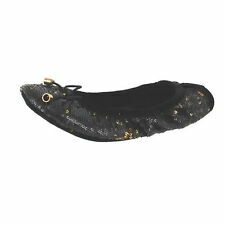 Dearfoams Womens Ballet Flat Slippers Size Medium. Shipped with USPS First Class Package. COLOR Black. SIZE M (7-8). Machine Washable. Multi-Density Cushioning System - maximum comfort. Machine washable - slip resistant - for indoor or outdoor use. Maximum comfort, machine washable, indoor / outdoor soles. House shoes. Navy blue and purple Dearfoams slippers, fuzzy, slip on scuffs, open back. Rubber soles, indoor / outdoor. 3 - XL 11 -12. 1 - L 9 -10. The size is a woman's XLarge or 11/12. Knit and woven fabric upper in a scuff slide slipper style with an open toe. Plaid detailing. Slide entry. Comfy Soft lining, cushioning Soft footbed. Textured outsole. Item is in good condition. Velcro closure. Very durable sole. Features: The original Dearfoams! Cooler weather is still here! Size: X-Large (XL 11-12). Dearfoams are known for their comfort, as well as their sturdy construction and durability. The soft insoles and tough outer soles of these women's slippers cradle and protect the wearer's feet. Dearfoams for women are designed to be cute and stylish as well as comfortable. They are great for slipping on first thing in the morning, or even wearing out for quick errands. They come in many different styles and sizes, so you can find ones that work well for you. What Materials are Women's Dearfoams Slippers Made of? These women's slippers feature unique materials specifically used to make them more comfortable. The insoles of Dearfoams feature memory foam which is designed to conform to the shape of your foot while cushioning and supporting the arch of the foot. This material moves with the foot, to provide continuous support and comfort.The insoles of these slippers are also covered in a soft layer of fabric. The part of these slippers that goes over the top of the foot is made of various types of soft fabrics including cotton blends, microfiber and micro suede. 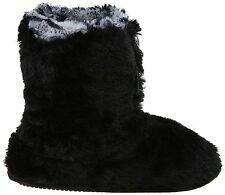 Many Dearfoams for women also lined with a plush, wool-like material or velour quilted material. These slippers work well for colder weather because the lining provides extra warmth. 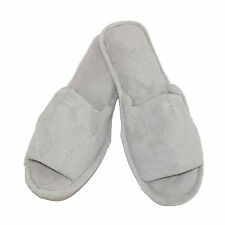 What Styles do Women's Dearfoams Slippers Come in? Dearfoams come in many different styles, which are suitable for different purposes. Open-toed slippers that are designed like flip-flops are one popular type of Dearfoams. They are easy to slip on, which makes them a good choice for those who want something to put on when they first get out of bed. The open-toed style is great for spring and summer wear. There are also close-toed slip-on Dearfoams that do not have any fabric over the heel of the foot. 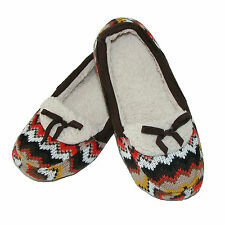 These women's slippers are also quick and easy to put on and they are warmer than the open-toed variety. Dearfoams with closed-toes and fabric covering the heel are also available. These are the warmest variety and ideal for winter wear. What Colors do Dearfoams Women's Slippers Come in? You can find Dearfoams in many different color schemes. These women's slippers are available in a wide variety of earth tones including shades of brown, grey, and green. Some of these earth tone Dearfoams feature linings that match the main color of the slipper while others have white or off-white linings. You can also find Dearfoams in soft pastel colors including pinks, purples and blues as well as bold primary colors. Some Dearfoams feature striped, floral or animal print patterns for those who want slippers with more than one color. Content provided for informational purposes only. eBay is not affiliated with or endorsed by Dearfoams.